HI all, new to PCSX2 - i've done a bit of trial-and-error with plugin settings, and can't get this game to run well. I get a 'slurring' of audio every 20 seconds or so. I have graphics set to native resolution. 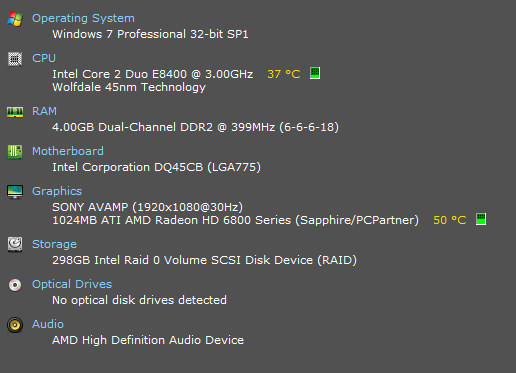 Here are my specs, any suggestions or advice? (02-22-2014, 02:57 PM)gneville Wrote: HI all, new to PCSX2 - i've done a bit of trial-and-error with plugin settings, and can't get this game to run well. I get a 'slurring' of audio every 20 seconds or so. Make an ISO of your disk instead of using the disc directly. According to Fraps its more or less locked at 60fps - but the gameplay stutters every few seconds. If it set Interpolation to 0 and Syncronizing Mode to 'none' it fixing the 'slurring' of the audio, but doesn't fix the smoothness of the game. I should have mentioned - i'm using an ISO. (02-22-2014, 07:08 PM)gneville Wrote: I should have mentioned - i'm using an ISO. Do you FPS ever dip under 60? Also try disabling you antivirus. If you use any speedhacks then turn it off and try again also make sure your powerplan set to performance(i want to cover every aspect which possibly make problem)! Antivirus is Microsoft Security Essentials. I can disasble it but that shouldn't make a difference.. .! Power plan is balanced - but it's a desktop PC with a CPU that doesn't throttle so much. Also - this PC can play Fifa 14 without too much trouble!